A Tasmania wine tour to enjoy an intimate day in the heart of the Tamar Valley with Bushie, Ben or Janine on a Tamar Valley Wine tour. With an impressive 234 vineyards across the state, Tasmania’s reputation for fine wine is growing with grapes producing the highest value per tonne in Australia. Visit up to six Tamar Valley vineyard cellar doors offering an outstanding range of Tasmanian cool climate wines and meet the people passionate about the wines they produce along with a wonderful lunch. Jansz Tasmania – A rustic and beautiful old timber winery where Jansz began is now a stunning state-of-the-art cellar door and interpretation centre set beside a lake amidst vines and wandering geese. Jansz is long acclaimed as one of Australia’s best sparkling wines. Delamere Vineyard – A delightfully rustic cellar door and one of Tasmania’s longest running family-operated wine estates, focused on producing distinguished sparkling and still wines from the Pinot Noir and Chardonnay varieties. Holm Oak Vineyard – Surrounded by beautiful vineyards and orchards and home to Pinot Pig with 12 hectares of vineyards which include Riesling, Sauvignon Blanc, Chardonnay, Pinot Gris, Arneis, Pinot Noir, Cabernet Sauvignon, Merlot and Cabernet Franc. Rosevears Estate – This cellar door is now home to Kayena and White Hills vineyard wines. The Tamar Ridge range of wines from Kayena offers a comprehensive range or wines for tasting and are known for its trophy-winning Riesling, Sauvignon Blanc and Pinot Noir. Rosevears has the full range of Tamar Ridge wines and Pirie Sparkling can be tasted at the cellar door as well as a range of the Devil’s Corner wines. The informative and friendly staff will guide you through the range of wines. Restaurant Lunch – Timbre Kitchen is an exciting new restaurant at Legana’s Velo Vineyard on the Tamar Valley Wine Tour route. Velo Vineyard – Velo is a small family-operated vineyard and winery and owner Micheal Wilson is an ex-Tour de France cyclist. 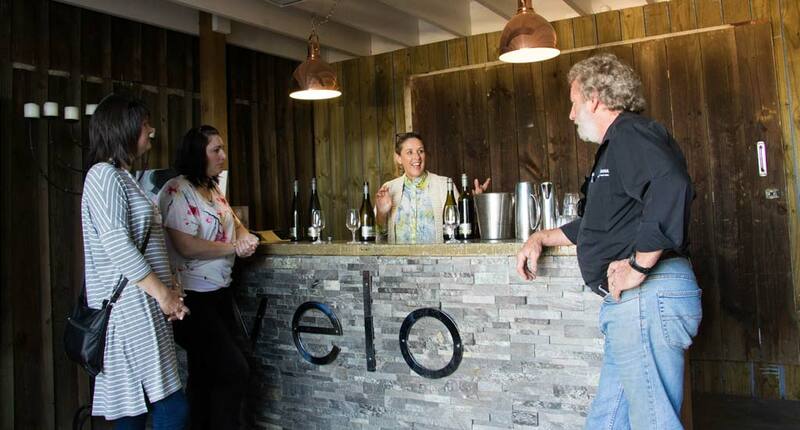 Velo Wines has enjoyed success with an award-winning range of vibrant fine wines: Vintage Sparkling, Pinot Gris, Riesling, Chardonnay, Pinot Noir, Cabernet/Merlot and Shiraz. 9.30am from Launceston or Scottsdale.